Today the arki_lab team organized a second workshop at Blågård Skole in Nørrebro as a part of our school project funded by Statens Kunstfond for the occasion of their 50th anniversary. The aim of the project is to provide opportunities for young students to learn about urban space and to engage them more in the democratic process of urban design thorough an interactive analysis of their local surroundings. Today’s workshop is a continuation of the initial workshop – Urban Run, in which students have explored the urban environment around their school. The focus on the second workshop was more specific and it involved analysis of the schoolyard as an urban space from a perspective of its users. Through an on-site workshop which involved plan analysis, prototype construction and collage making, the students were able to transform the schoolyard in accordance with their ideas. Firstly, Rasmus and Jeanette introduced the workshop with an analysis of the plan of the immediate area around Blågård Skole. This discussion addressed the ways students use the schoolyard and its surrounding area while taking into account multiple sets of users. Furthermore, in order to apply students’ ideas, we have provided a large number of soda crates as building material of prototypes which transformed the schoolyard. During this practical part of the workshop, the arki_lab team worked with four groups of students who expressed their ideas on how to improve the usage of the space in terms of its infrastructure and furniture. For instance, Jeanette’s group addressed the need for more furniture that could be used for socializing outside by buliding a sitting contruction with a rooftop. Interestingly, this group has expressed a need for more intimate spaces rather than the active ones, which have positive effects in terms of inclusion of female users. Furthemore, the same group tackled the need for higher awareness of the bikers about the school area by constructing a structure that slows down the bike traffic on the main lane in front of school. 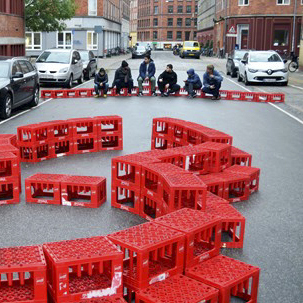 Other groups used the soda crates construction to experiment with different structures and manipulations of the schoolyard. Finally, the participants described their visions in the final part of workshop, which involved collage making. Here they expressed the main ideas of their practical projects in relation to space, uses, users and potential materials. In this way, students had an opportunity to learn about the design of urban space and planning though contextualization and taking into account variety of users.